much love, illy: sponsor love : interview + giveaway with Jaclyn of Jaclyn1423. some mega July sponsor love + a giveaway winner!! she's the best. she really is. sponsor love: Le Mode Accessories Giveaway!! i had a craving, yo. i had one of my moments ((again)). welcome to the world, Princess Lily Rose!!! i feel uber smart when i play kids week jeopardy. it's a party in the USA...yeaaaaah. my lil' ole happy list for the week. sponsor love : interview + giveaway with Jaclyn of Jaclyn1423. is this girl not the cutest? 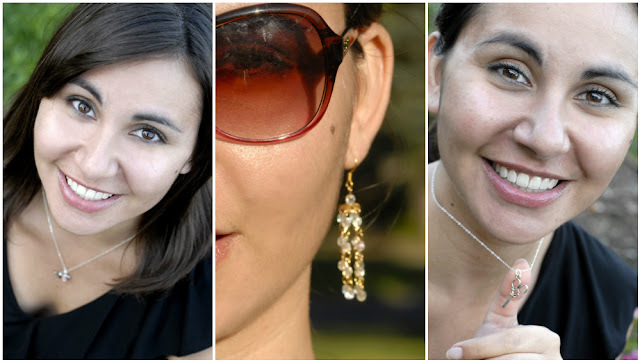 her smile is infectious and her handmade shop pieces, absolutely dainty and oh, so pretty! i love the vintage, upcycled pieces. and what's even more inspiring is that many of her items are sold and the sales from those items goes towards the Autism Speaks organization. be sure to check out both her shop and her blog for some mega inspiration! three random facts about Jaclyn. 1. If I ever got to meet Stephen King, I would embarrass myself because I'd probably start stammering like a fool, even though I've known the two questions I'd ask him for the past four years or so. 2. I've slept with my stuffed polar bear, Iggie, since I got him, when I was 6; he's kind of formed the shape of the crook of my elbow, so it's more like a pillow with a cute face. 3. The two major things my Donald Duck collection is missing are a Donald lamp (solo, no silly mice or nephews invited) and salt and pepper shakers. tell us about your shop. I love browsing antique shops and thrift stores, and in my mind, browsing Jaclyn1423 is something like that. You never know what you'll find, and so many of the pieces are upcycled or reused: Clip earrings and dollhouse furniture becomes necklace pendants, childhood games become jewelry. I love color, texture and whimsy. And jewelry. I really love jewelry. a $25 shop credit to Jaclyn1423!!! if i were you, i'd take my pick at this one and totally kick it like "middle school" and give the two other necklaces to my BFFs. are they not so stinkin' cute?! visit the Jaclyn1423 shop and comment below on what you'd spend the shop credit on. use coupon code 14MUCHLOVEILLY23 at checkout from her shop to receive 15% off of your entire order! Giveaway is open to ALL Much Love, illy readers thru midnight, July 25. Winner will be announced on July 26.
ooh, first comment? i adore the Upcycled braided seed bead necklace. i hearted her shop on etsy! Unique pieces for sure. I'm really adoring the faded glory. i am lovving the A bit of love. Charm necklace. Gold and rose glass beads.!!!! i would spend my shop credit on that! i love her rock paper scissors necklace!! I'd love to have 2 pairs of the so pretty Elizabeth II Canadian Penny Earrings, one for me and the other for my mom. I follow your blog with gfc, thanks for the lovely giveaway. I really love the dainty black beads necklace! I'm a new follower! Hi! I would definitely go for the ice blue blue lace agate bracelet. Blue lace agate is one of my favorite stones! I am loving the Sterling silver cross necklace!! so beautiful. this is a great giveaway! I also followed your blog!! I am following Jocyln on twitter. I have tweeted about the giveaway and mentioned both of you in it! I love the sterling silver simple cross. i like the Soft pinks Tulle floral Necklace and bracelet set & the Vintage cuff bracelet! 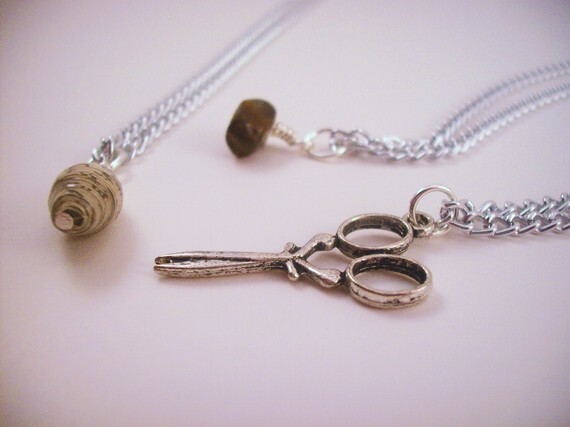 i love the rock/paper/scissors bff necklace - so cute! I just LOVE the upcycled flower necklace. Its beautiful! I like the vintage cuff bracelet!! I publicly follow your blog! i liked her shop on etsy! I would totally get the Opaque white pendant. I'd probably pick the BFF Necklace Set too, but I also like the Simple Sterling Vintage Cross Necklace. I added her shop to my favorites: exotiKat. I would spend it on the Vintage 12K cameo. Acrylic pearls. Long Victorian necklace. I would spend the credit on the Brown,Gold and Green Beaded Pendant-gorgeous! i would go for Blue lace agate. Wire wrapped. Vintage chain. Mystical. I'd pick the Vintage Bauble Ring. Elizabeth II Canadian penny earrings is what I want to buy in her etsy shop. Hope I win :) Btw, I have a blog party called Market Your Biz and Giveaways. Please feel free to link up your giveaways tomorrow at 5 pm PST. I went to her blog but can't find the follow button so I just left a comment telling her that I came by way of your blog. I'd love the For a vintage beauty. Faux diamond and pearl necklace and earring set. Perfect condition. It's hard to choose! Well, I guess I would use my shop credit for Upcycled tribal pendant. Faux suede chain. 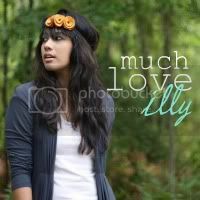 I am now a GFC follower of Much love, illy. I heart Jaclyn's shop on etsy! Wow, she has a lot of really great stuff! So cute!! Love the Sweet little belt buckle ring. Clear rhinestone. Vintage. I "hearted" Jaclyn's shop on Etsy as barniegirl! 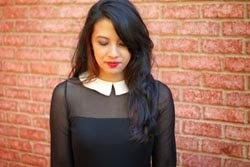 I'm following your blog as barniegirl! I follow this blog via Google Friend Connect. I subscribed to Jacyln's blog! LOVE: Vintage cuff bracelet. Upcycled with flowering pieces. Perfect for spring and summer. I would love to get the vintage bauble ring! Love it all but I think I'd get Vintage multi strand necklace. Acrylic beads. Long. Layered. Turquoise. I hearted your shop on Etsy. love the vintage multi strand necklace! I love the ceramic earrings that are on clearance! i love the vintage cuff bracelet upcycled with flowering pieces!! love the colors!! now subscribed to Jaclyn's blog! I love the upcycled tribal pendant. Great Shop! I love the Vintage Spoon Locket Necklace! I follow your lovely blog through GFC. I like Triple Strand Illusion Necklace. I would spend it on this Vintage Locket Spoon Necklace. It's so unique. i'm a GFC pub. follower of yours! Upcycled earrings. Bright jade. Two-toned gold. - faaav item! i love the Triple strand illusion necklace! I like the Soft pinks. Tulle floral. Necklace and bracelet set. Thanks for the chance into this giveaway. I'd choose the 'Ivory and antiquated floral gold pendant. Glass pearls. Gorgeous necklace.' :) Love it! Ohhh I also love the BFF rock/paper/scissors necklaces set of three. It would be perfect for my daughter & her two besties! i adore the Upcycled braided seed bead necklace. i hearted her etsy shop! i follow jaclyn on twitter! Love the Hear Me Roar necklaces! I'd get the tulle floral necklace and bracelet set! I love the Triple blueberry necklace. Lightweight and sweet. I just adore Jaclyn1423 and her fabulous Etsy Shop - I could easily spend this generous GC at least five times over just on items I fell in love with on page one alone! I'd already Etsy "favorited" Jaclyn's marvelous Etsy shop as well as many her amazing creations. (I'm Salleefur on Etsy.) Jaclyn1423 is truly one of my most favorite jewelry shops on or off Etsy! I love the rock paper scissor bff necklaces! I hearted the etsy shop as hybroanglid. I follow muchloveilly on Twitter as hybroanglid. I follow Jaclyn on Twitter as hybroanglid. I like the Hear Me Roar empowerment necklace. i love woodland fairies poppy ring and poppy headband! !